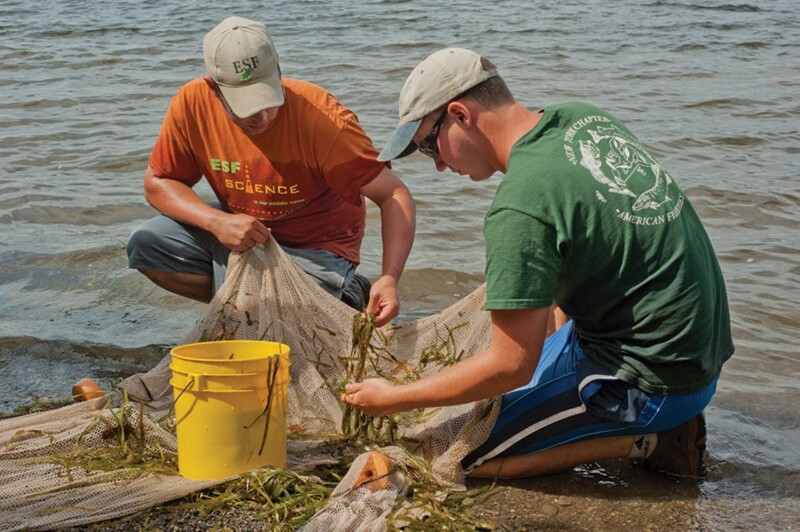 Chris Nack, a fellow with the National Estuarine Research Reserve seining in the Hudson River near Catskill on August 2, 2011. 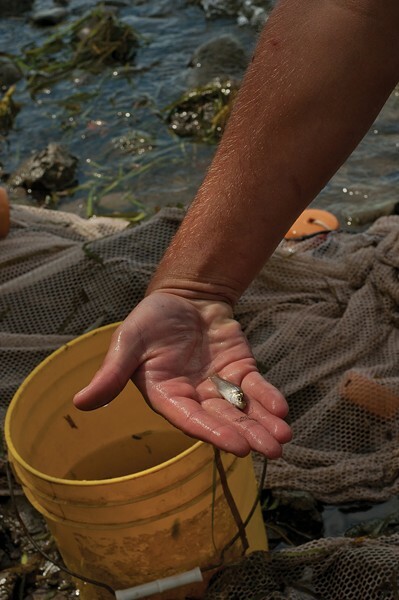 A young (aproximately one year old) shad found while seining near Catskill in 2011. Sometime in April, when the little white clusters of Dutchman's breeches and the shadbush are in bloom, schools of shad enter the Hudson from the Atlantic Ocean and swim upriver to spawn. From mid-May to the end of June, shad mate, a dance that usually begins at dusk in shallow water. In The Founding Fish, John McPhee describes the process, as he observed it standing over a tank in a Maine hatchery: The migrating fish are milling around when the males start nosing the females, who bolt, dribbling eggs while being chased by the thrashing bucks. Eventually, the fish pair off and trailing eggs and milt, turn the water milky white. The fertilized egg masses sink to the bottom, where after a week or so they will hatch into tiny larvae, each attached to a yolk sack. The mating ritual happens repeatedly over a month and a half. In a single spawning season, a female will release 300,000 eggs and likely more than a million over her lifetime, given that the life span of a shad is 10 years. Sometime in June, the spent fish swim back down the Hudson and north along the coast to the Bay of Fundy, the summer feeding grounds for virtually all of the shad that has spawned in rivers along the North American coast. In the fall, the fish follow the warming currents as far south as Florida (tagged Hudson River shad have been found as far south as coastal Virginia). Meanwhile, as the water temperature cools, the three-inch-long juvenile fish have begun migrating down the Hudson. It's a daunting gauntlet to run, filled with predatory striped bass, smallmouth bass, and white perch. As described by McPhee, the schools of small fish "dimple" the river—leap into the air and churn the water white, a phenomenon caused by the young shads' terror-stricken attempts to move to the top of the water column in order to avoid the chomp of a smallmouth bass below. Those that make it to the ocean—that don't get eaten and avoid getting sucked into the massive intakes of river water at the Indian Point nuclear power plant—are called "recruits," as if they've signed up for the Green Berets. The fish that return three or four years hence to spawn have been likened by some observers to Olympic athletes. "They come in under a lot of stress," says John Lipscomb, patrol boat captain for Riverkeeper. 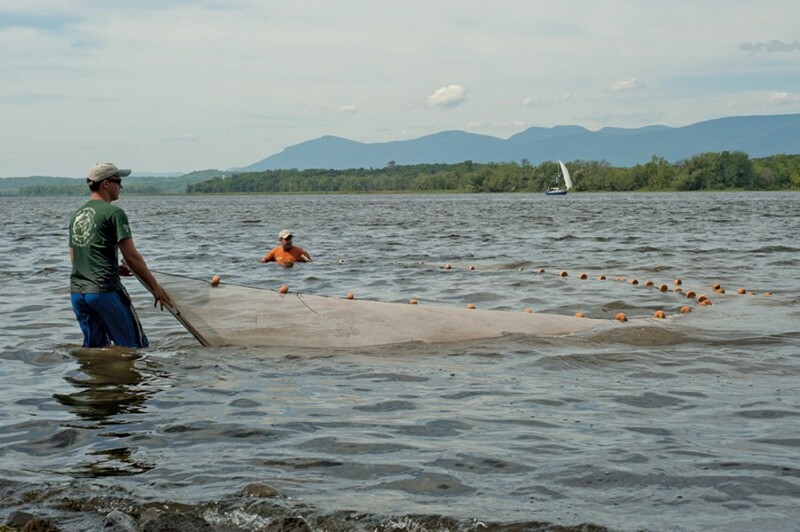 "They come into the Tappan Zee and Haverstraw having gone from breathing in salt water to fresh water, which requires changes to their gills and kidneys. The females are using lots of energy to make eggs. They're not eating too much. It's a heroic effort by these fish." The shad's ability to adapt from saltwater to freshwater and vice versa is one their more remarkable features. A shad larva will die in salt water: It's only when it transforms into a juvenile fish that it develops salinity tolerance. One mystery is that once the young fish have migrated into the ocean, they can't adapt to freshwater until they make their first spawning journey several years later. Shad also have extraordinary hearing: their sensitivity to high-frequency sound—beyond that of any other fish—is believed to enable them to detect the clicks of dolphins and other marine mammals that feed on them. Historically, shad were the Hudson's most significant fish, and up until a couple of years ago, the shad catch was a spring event. The smoked or baked delicacy, accompanied by the sauteed roe, or eggs, ideally wrapped in bacon, was served up at eponymous festivals and local tables. The fish was that rarest of things: a delicious local wild food linked to a long cultural tradition, from the urban immigrant tables of the 1880s to the drying racks of the Mahicans. But in 2010, the Department of Environmental Conservation closed the commercial and recreational shad fisheries. The long-term restoration plan—the shad aren't expected to recover to sustainable levels until 2050—means many of us won't be catching or eating Hudson River shad in our lifetimes. Today, if you see a shad on someone's table, it's either illegal or shipped in from another state. It was a sad occasion for the few shad left fisherman on the river. No one, however, disputes the wisdom of the DEC's decision. Populations of shad have been crashing coast-wide, according to data collected by the Atlantic States Marine Fisheries Commission. The ASMFC, a regional organization that sets regulations to protect fish inhabiting the ocean and riverine waters off the Atlantic coast, plans to institute a moratorium on all shad fishing within its jurisdiction in 2013, unless a member state can prove its fishery is sustainable. New York is obviously ahead of the game, but then, according to ASMFC's shad stock assessments, the fish in the Hudson are taking a particular hit: While the populations in other East Coast rivers have stabilized—a few have even increased slightly—in the Hudson they have been steadily declining.